Approximately 25 percent of men between the ages of 35 and 44 have high blood pressure, according to the Centers for Disease Control and Prevention. What’s even more alarming is that only about half of them have the condition under control. If left untreated, high blood pressure can lead to heart attack, stroke, kidney disease and heart failure. While some men might need the help of medication, many more may be able to control their blood pressure by following a healthy diet. According to the National Heart, Lung and Blood Institute, diets that are low in total fat, saturated fat and cholesterol and high in fruits, vegetables, whole grains and low-fat dairy products help reduce blood pressure. This eating plan, called the Dietary Approaches to Stop Hypertension, or DASH, diet allows only 27 percent of calories from fat, 6 percent of which is saturated fat. Carbohydrates make up 55 percent of calories on the diet plan, while protein provides the remaining 18 percent. While on the DASH diet, you eat 6 to 8 servings of grains, 4 to 5 servings of vegetables, 4 to 5 servings of fruits, 2 to 3 servings of low-fat dairy products, 2 to 3 servings of healthy fats and oils and 6 or fewer servings of lean meats, poultry and fish. You’re also allowed 4 to 5 servings of nuts and seeds and 5 or fewer servings of sweets or added sugars, like jam, per week. If you’re overweight, losing weight can have a significant effect on decreasing both systolic and diastolic blood pressure. Following the guidelines of the DASH diet while also paying attention to calorie intake has a greater impact on blood pressure than following a low-fat diet alone, according to the Colorado State University Extension. Calorie needs differ based on your height, weight, age and activity level, so work with a nutritionist to calculate the ideal number of calories for you. Current dietary guidelines recommend limiting sodium intake to no more than 2,300 milligrams per day; however, if you have high blood pressure, you should limit intake to less than 1,500 milligrams per day. Focus on fresh, whole foods and stay away from packaged, canned or frozen foods, which are often loaded with excess sodium. During cooking, flavor foods with sodium-free spices and fresh or dried herbs. A high potassium-to-sodium ratio is associated with a greater likelihood of the ability to maintain normal blood pressure because potassium reduces the effects of sodium. 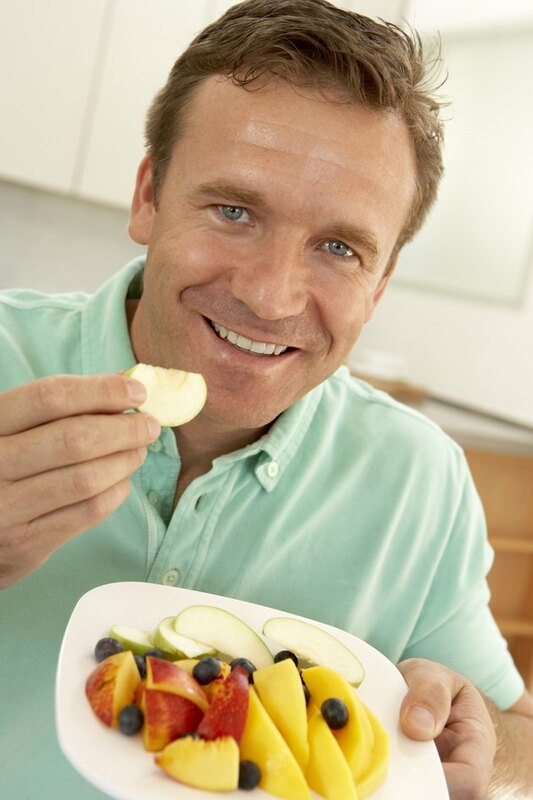 A 40-year-old man with high blood pressure should consume at least 4,700 milligrams of potassium each day through intake of potassium-rich foods like potatoes, tomatoes, bananas, mushrooms, tuna, oranges, raisins and leafy green vegetables.